For modern software udpate, it is impractical to push out updates immediately to tens of millions devices. 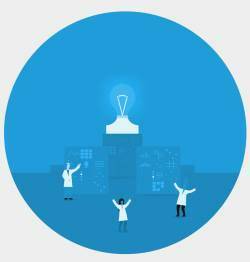 Most companies roll out update in batches so that the update will not crash the server. And at the same time, quick feedback can be gathered before a full-scale roll-out. Chromecast Preview Program is just to let you enroll your Chromecast (including Chromecast 1st gen, Chromecast 2nd gen, and Chromecast Audio) into the first batch of devices to receive the udpate. You may have some questions on this program, this list should clear your doubts. It is NOT a beta program. Actually, Chromecast beta program is by invitation only (and now there are no invitations for owners outside of Google). You must opt-in to get into the Chromecast Preview Program. The enrollment is per-device, not per user. If you have 5 Chromecast devices, you need enroll them one by one. Or you can just enroll one or two of them. It is up to you. All Chromecast devices are included: Chromecast (1st gen), Chromecast 2nd gen, and Chromecast Audio. The udpate you get is the coming official udpate (preview) that has passed beta stage and is approved for official update. Of course, if serious problems were found, Google may postpone the update. The lead time you can get usually varies from a few days to one or two weeks. If you factory data reset Chromecast device, your device will be removed from the Chromecast Preview Program. 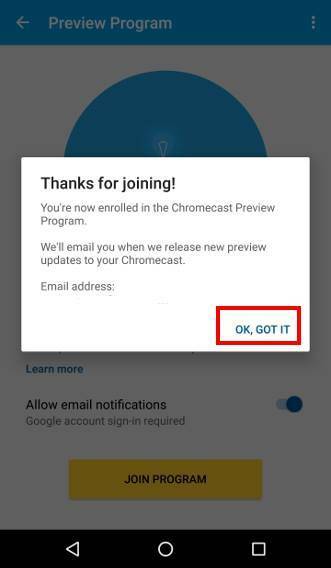 You must enroll in again as a new device..
You can opt-in or opt-out for email notifications once you opt-in for the Chromecast Preview Program. 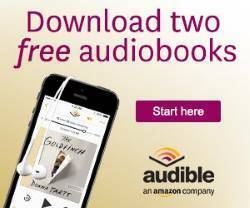 You can opt-in and opt out the program from Android or iOS devices. You cannot do this from PC. How to join Chromecast Preview Program? You can join Chromecast Preview Program by following these steps. 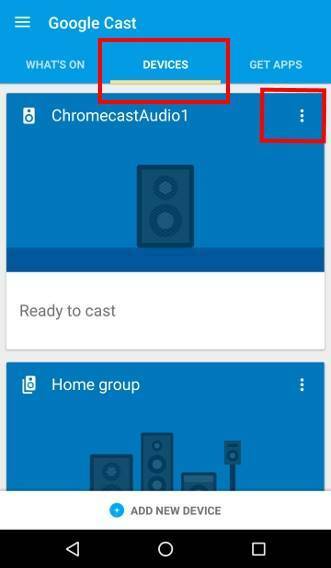 You can join or leave Chromecast Preview Program from Android or iOS devices using Google Cast app (which supersedes Chromecast app). 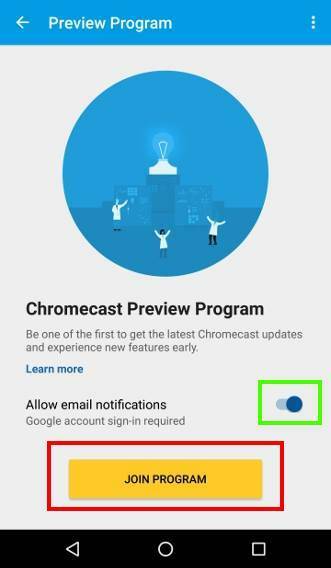 Although you can manage some settings of Chromecast devices from a PC in Chrome browser (with Google Cast extension), you cannot join or leave the program from PC currently. So, you need to start Google Cast app (Chromecast app) in your mobile device. Tap Devices as shown below to see a list of Chromecast devices in your network. 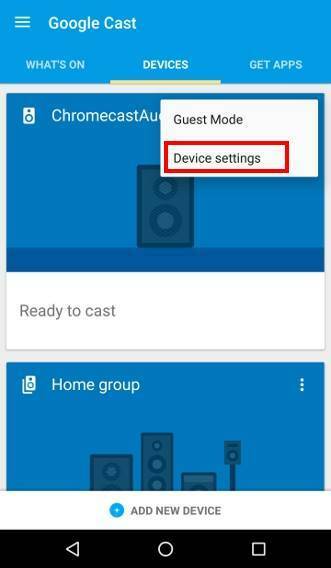 Please follow this guide on how to use Google cast app (Chromecast app). For example, as shown above, you want to enroll Chromecast Audio1 into the preview program. Tap the menu button (3 dots), then tap Device settings, as shown above, to access device settings for this device. In Device Settings page, you can find out the Preview Program is off currently. Tap Preview Program as shown below. In the Preview Program page, tap Join Program as shown below to join the program. Optionally, you can opt-in for email notifications when new update is installed. When you opt-in for email notifications, you need to sign in with Google account. You’re now enrolled in the Chromecast Preview Program. We’ll email you when we release new preview updates to your Chromecast. Tap OK, Got It. Or dismiss the notification. You can check the status of your Chromecast devices in Device settings page. 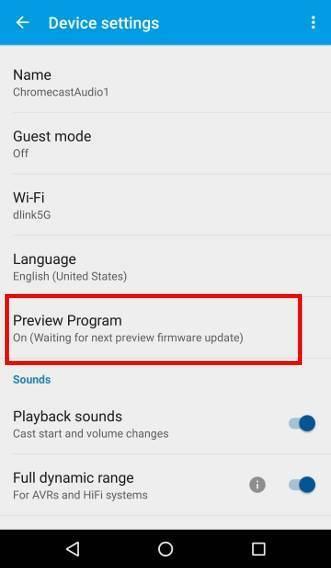 For example, as shown above, the Preview Program status in this device is changed from off to On (Waiting for next preview firmware update). It means that you just joined the Chromecast Preview Program and are ready to receive the next preview udpate. It means you left (opt-out) the Chromecast Preview Program. You will get public update as most other Chromecast owners. It means you never joined the preview program. You will also get this status if you reset your Chromecast device. How to leave Chromecast Preview Program? If the preview program status is ON for your device, you can leave the program. In Preview Program page, you should have the yellow button of “Leave Program” (instead of “Join Program” as shown abovbe). 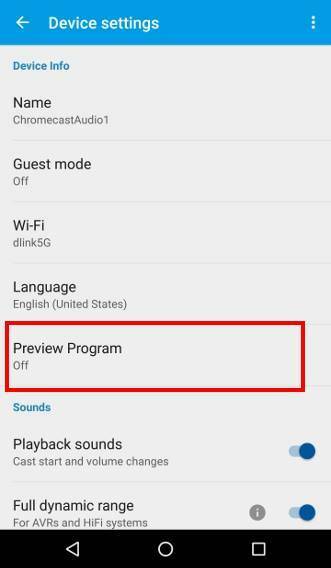 Tap Leave Program to opt-out of the Chromecast Preview Program. Do you have any questions on Chromecast Preview Program? If you have any questions on using or joining Chromecast Preview Program, please let us know in the comment box below.